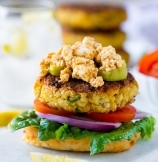 Chickpea Burgers - Mediterranean flavors, chickpeas, feta cheese in one meaty yet meatless veggie burgers. Sandwich in buns, top on salad or make a wrap! 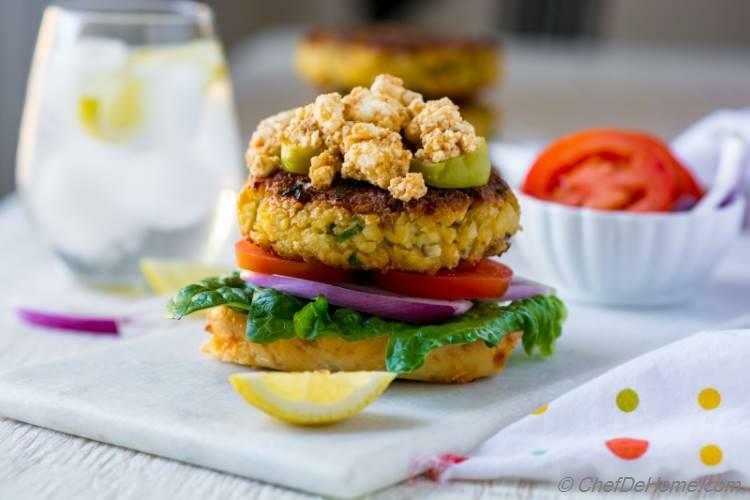 In these chickpea burgers, bold Mediterranean flavors join forces with chickpeas and feta cheese to make juicy, meaty yet meatless veggie burgers! Seasoned with cumin, and oregano, flavored with garlic, red onion, hint of olive oil, feta and chilies... These patties are so packed with flavor that these literally taste like a meaty well-prepared burger.. only meatless. There is not better way to keep Monday dinner meatless, veggie-full, protein packed, and still delicious. 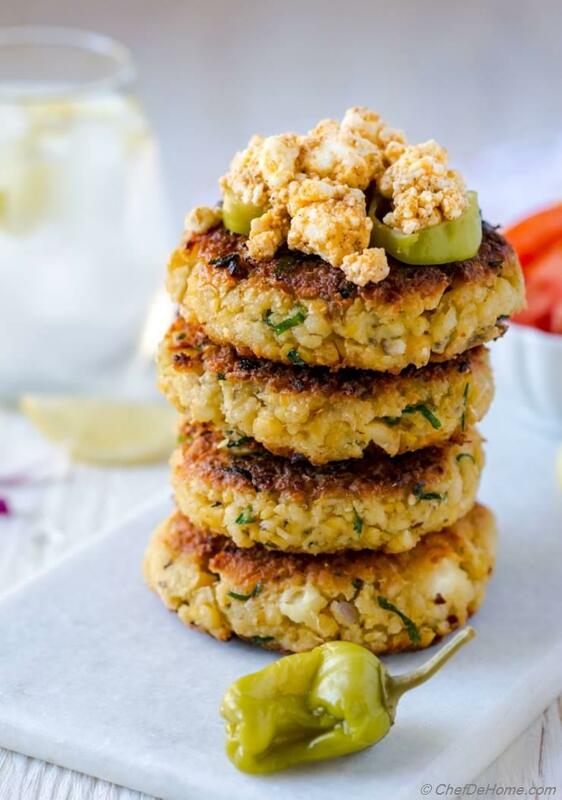 Juicy chickpea patties go great with topping of spicy feta cheese and tahini sauce, over a salad for a boost of protein, or sandwiched in burger buns or a pita wrap. A batch of these cooked patties stay good in refrigerator for 5-6 days. Which means I can make a batch at weekend, enjoy chickpea burgers for Sunday dinner... and then use remaining patties to top on salads, or another round of veggie burgers in weekdays. In-fact, when Vishal has plan to eat grilled chicken for dinner, I love grabbing few of these chickpeas patties and pamper myself with a veggie burger - chickpea patties, lettuce, tomatoes, red onion and topping of spicy feta cheese! pure yumm! These chickpea burgers are *one of such veggie burgers that Vishal would happily eat for any meal. He is not so easy to convenience for a veggie burger and is often brutally honest when it comes to my recipes. So, for me there are two-step approval for any thing I cook for blog. First, it passes my taste test in the kitchen. Second, it passes Vishal's honest review. Amazingly, these chickpea burgers... he will special ask to include in weekday dinner menu. So, I know this recipe you all will love too! *PS: the other favorite veggie burger of my better half is Black Bean Veggie Burgers. 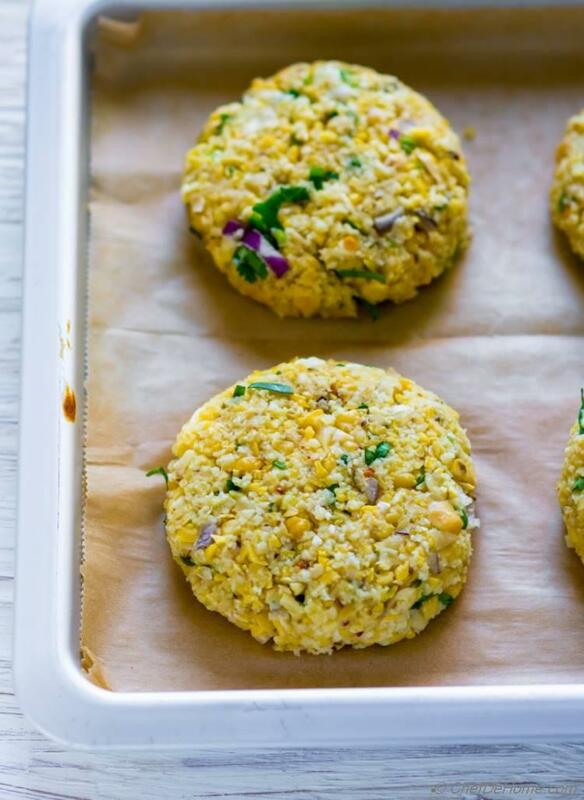 There are two ways you can cook these chickpea patties - pan sear or grill. To be honest, I love to pan sear the patties with little bit of oil. I like to cook'em slow so that egg (used for binding) cooks through. In this time, burger gets nice brown crust which is my favorite with tangy feta cheese. 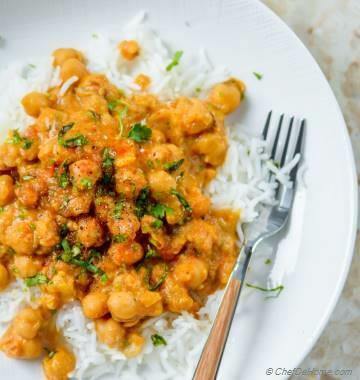 I used pre-cooked low-sodium organic chickpeas for this recipe. You can cook chickpeas at home too. Just make sure if not using low sodium, then taste the mix before adding more salt. Since I can't eat raw eggs, I taste the mixture before egg goes in, then add more salt if needed. ..but please, don’t skip or replace breadcrumbs in this recipe. This dish really needs breadcrumbs to get the texture right. You might find patties little loose when mixture is just assembled. But as these sit in refrigerator, breadcrumbs soak all extra liquid and tighten-up the chickpea patties. You can double the ingredients, if you prefer (I actually love to do that). That way you serve a large group or leave a few to serve healthy veggie-burger-salad. Pretty please. What is spicy feta, you might ask. My inspiration behind spicy feta is Fire Feta - chili oil flavored feta cheese served in most Mediterranean restaurants. To make spicy feta, I seasoned salty crumbled feta cheese with hot oil and paprika. This feta mix is only moderate spicy with subtle flavor of mild paprika. Due to hint of oil.. it plays double roll on chickpea burgers. 1) As a Layer of Salty Cheese, the heart of a good bruger. 2) As a Creamy Burger Dressing to bring everything together. 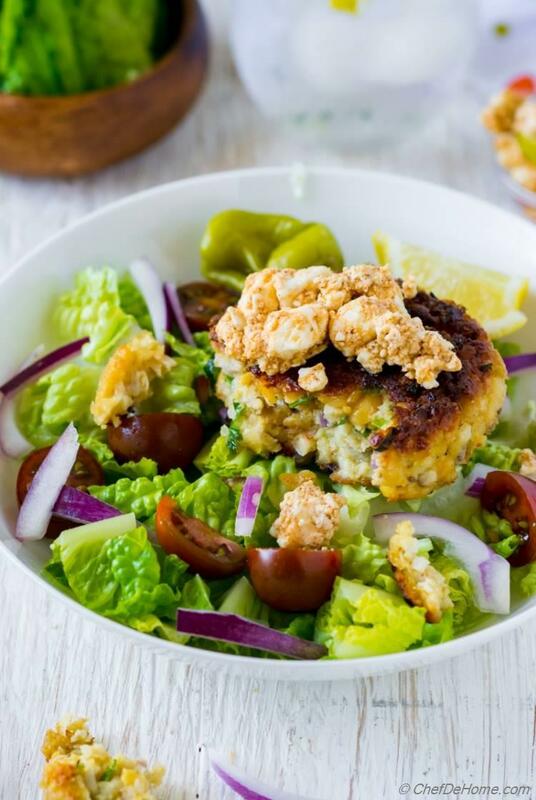 By far, spicy feta makes patties even more delicious! Like I said, this chickpea burger recipe is convenient, long lasting and very easy to put together. To prepare the chickpea patties, I pulse cooked chickpeas in food processor until rough chopped, not pureed. Leaving chickpeas little chunky give good texture to burgers. Then, I combine the chickpeas with seasonings - cumin, oregano, garlic, oil, minced chilies, and feta cheese. For binding, I add milk, bread crumbs, and egg. A quick mix of herbs and minced red onions and chickpeas patties are ready to assemble. Once I have rolled the patties, I line uncooked patties on a baking sheet and refrigerate for at-least 30 minutes to overnight. During this time, breadcrumbs absorb any extra moisture in burger patties. Along with eggs, these also tighten up or bind the burgers... which means burgers will not fall apart when cooked. You can cook'em just after 30 minutes or leave refrigerated up-to 24 hours before cooking. 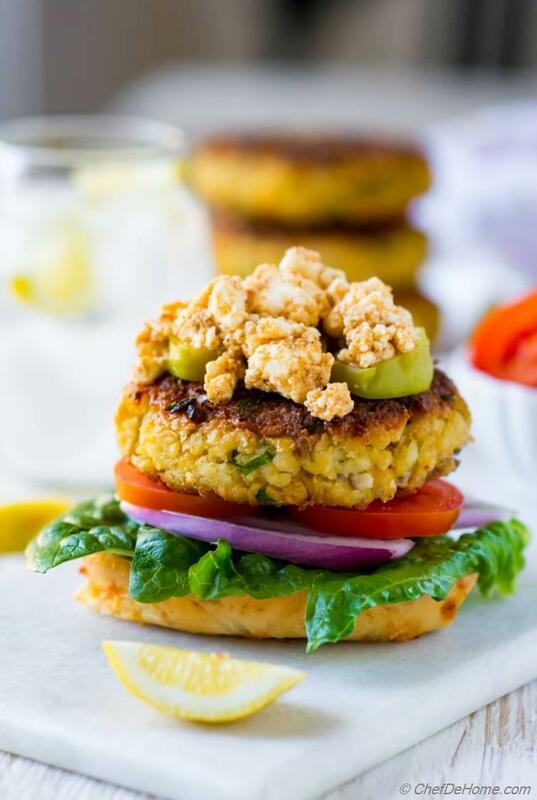 This chickpea burger recipe is super yummy and one of my favorite food! The best part? It’s ridiculously easy to make! 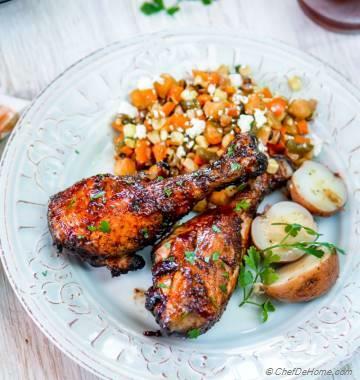 A perfect vegetarian dinner for Monday or whenever you craving some chickpeas and feta yumminess! I'm making this recipe available on Sunday.. 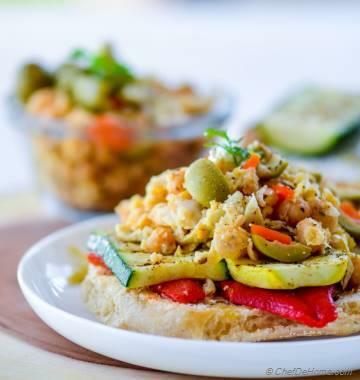 So that you can enjoy a scrumptious Chickpea Burgers for Monday dinner! Total Time 25 minutes Prep Time 10 minutes Cook Time 15 minutes Difficulty Easy Yields 6 Patties Serves 6 Notes No. of servings depends on serving size. 1. Spicy Feta: Set aside 2 tbsp feta cheese. Heat 1 tbsp oil in a pan, add all paprika and 1/2 tsp cumin and remove from heat. Pour oil over remaining feta and mix well. Set aside. 2. In a large bowl, add egg, oil, salt, milk and beat with fork/whisk until well combined. 3. Pulse the chickpeas until coarse chopped. Remove into bowl with egg mixture with minced chilies, seasonings, bread crumbs, onion, garlic and cilantro. Mix well. Cooked patties stay good in refrigerator for up-to 1 week, can be frozen for up-to 6 months.